Well done to Sophie, Caitlyn and Sarah who raised £265 pounds for Children In Need last week. They are pictured setting up shop, selling their delicious homemade cakes and a exercising a spot of merchandise quality control. 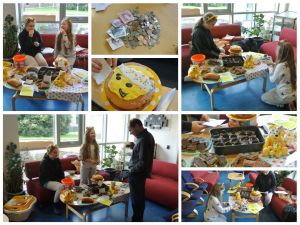 Staff and students helped them raise a fabulous total. 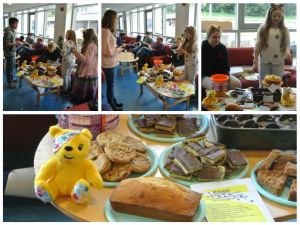 Review their previous 2012 and 2013 cakes and fundraising through our blog posts. A great effort all round, we look forward to seeing you again next time. 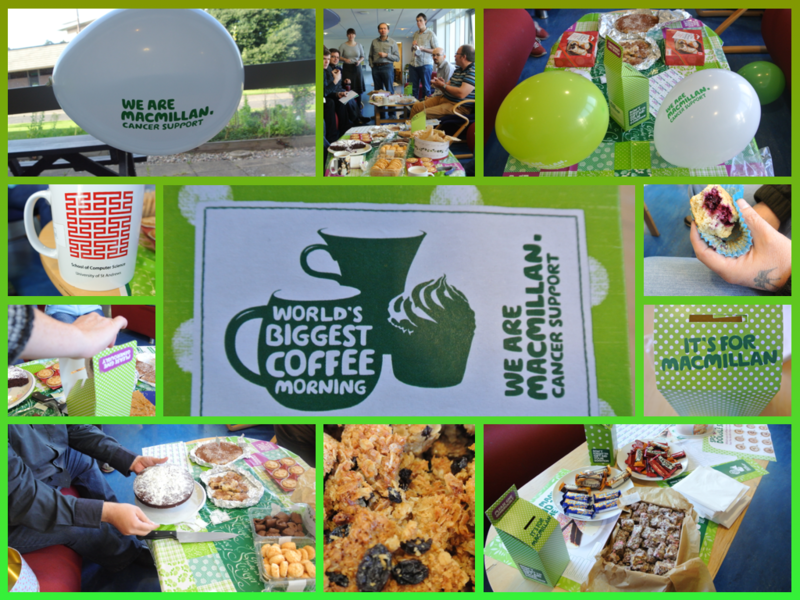 Another successful Coffee Morning organised by Ishbel Duncan has raised in excess of £170. 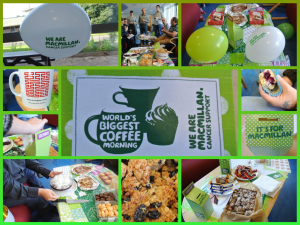 Today is the UK’s annual biggest coffee morning in aid of MacMillan Cancer care. 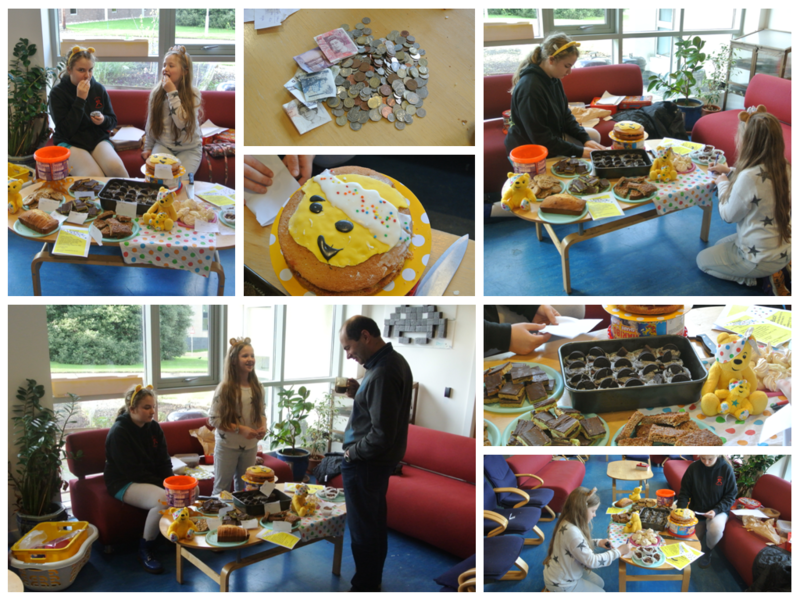 Staff and students are pictured sampling the home baking on offer and participating in the Raffle. 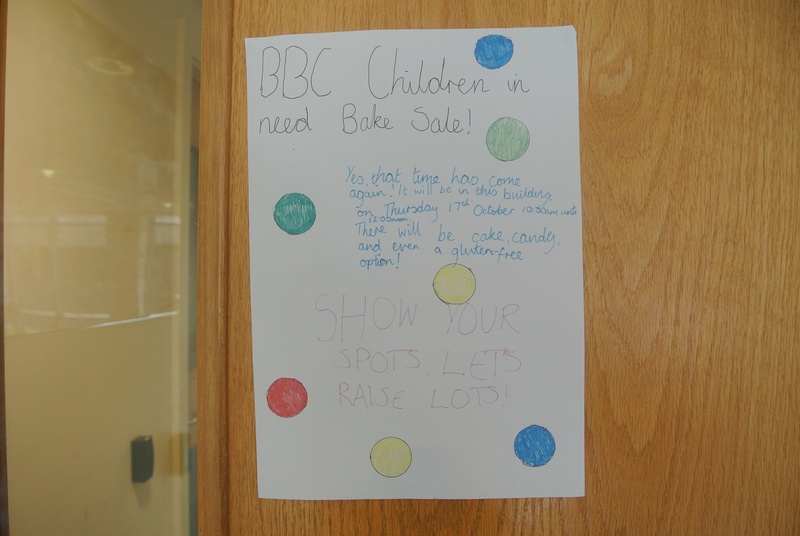 There are still some cakes on offer in the coffee area. Donate generously. 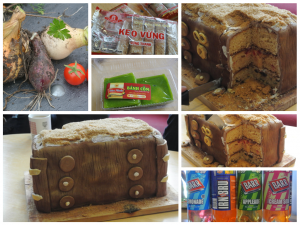 Highlighting the School’s penchant for the sweet and fizzy, earlier this week Long Thai returned from vacation with Vietnamese sweets including: bánh cốm (green sticky rice cake), sesame candy, peanut candy and chè lam. 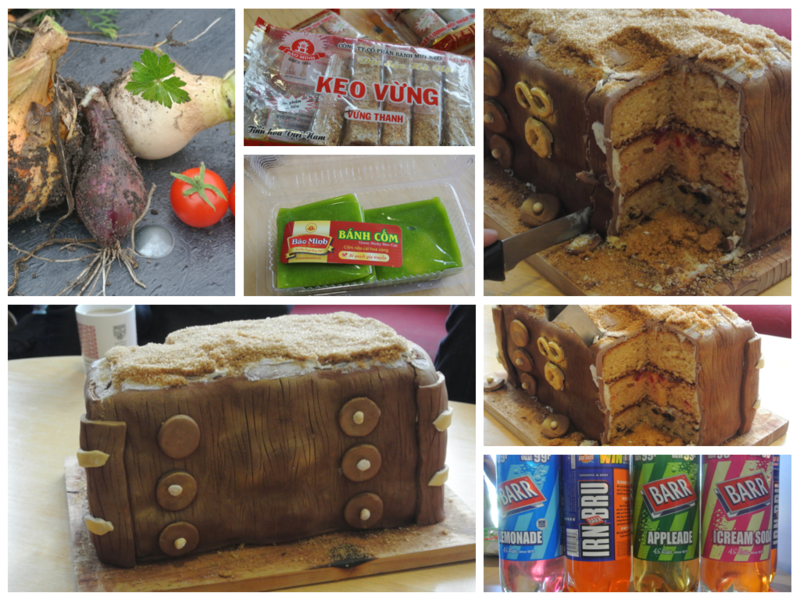 Tom Kelsey introduced a Game of Thrones Cake. 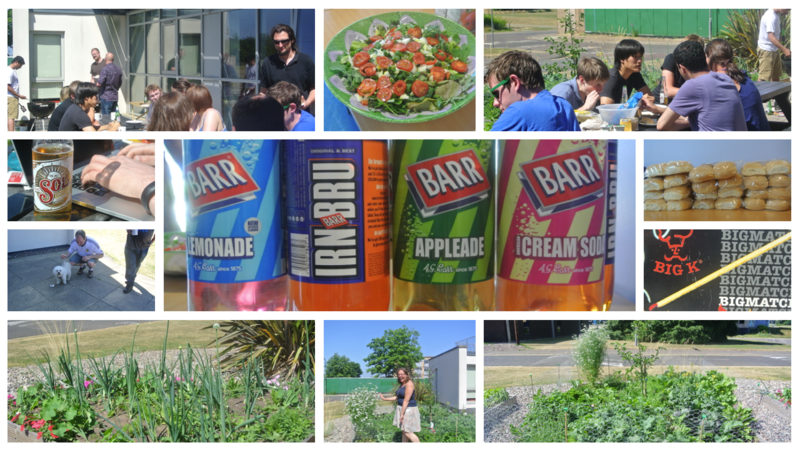 The StACS garden continues to offer fresh vegetables and BARR’s fizzy pop survived longer than a day. School President James Anderson and Careers Adviser Ben Carter invited recent graduates Matt Hailey, Ali Scott, Craig Garrigan and Steve Lowson back to the School yesterday to share their experience of working in the real world since graduating, with our final year students. They have been successful in securing positions at highly regarded companies including Sky Scanner, PlanForCloud, NCR and NCC Group. Talks described career paths, roles and responsibilities, professional development and current employment opportunities. Find out more about using your Computer Science degree and read student case studies on the careers website. Thanks to all for a great afternoon. Yes, cakes were consumed. Steve, Ali and Craig prepare to give their talk. Matt and Ali reminisce in the coffee area. 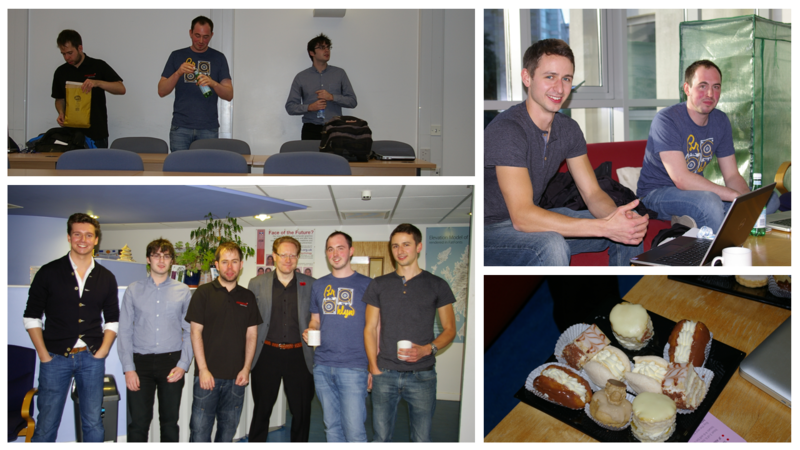 James, Craig, Stephen, Ben, Ali and Matt joined our final year students for cake and questions. 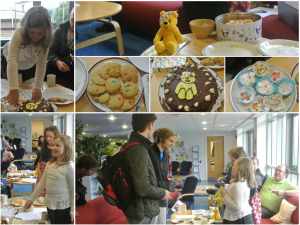 Well done to Sarah and Sophie Gent, who have been busy selling delicious home baking in the coffee area. 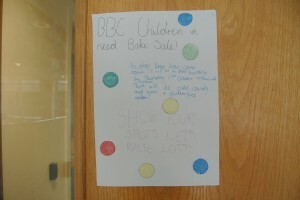 The money raised will go to Children in Need. 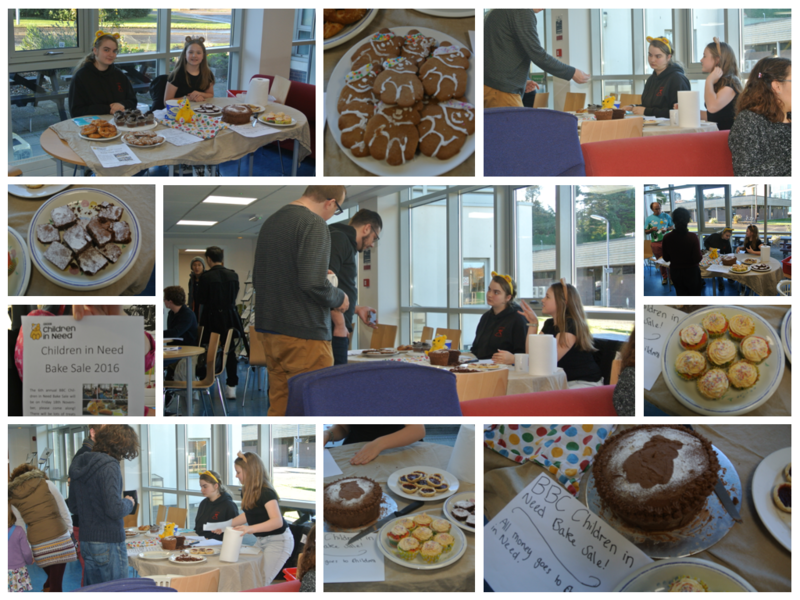 The bake sale pictured below is in full swing. Stocks are almost depleted.